There's now a new way for a small business owner to directly access prospective buyers for their business. While big markets has Wall Street to help them buy and sell, who helps smaller markets do the same? The answer, ExitAdviser. ExitAdviser is the online solution that helps guide owners, looking to sell, through the process. Supported by experienced Business Brokers and Advisers, ExitAdviser provides owners with a comprehensive set of online tools, how-to guides, legal forms and templates and access to near by advisers. ExitAdviser offers a robust FSBO-platform to prepare and promote your business for sale with four easy steps: Check, Prepare, Go, Close. Check the Status: This is a reality check for you. A last chance to be sure that all of your bases are covered. Prepare for Sale: An additional benefit of this preparatory work is that you’ll be more confident about the data inputted to ExitAdviser’s business Valuation Tool, to identify a price range for the business, from which a final Asking Price can be selected. Go to Market: ExitAdviser provides you with the most efficient, yet confidential route to market - to run a targeted advertising campaign on Google Search platform. Close the Deal: ExitAdviser gives you tips on how to stay one step ahead of prospective buyers. Online self-service tools can prove a realistic substitute for expensive sales broker charges. Particularly now that mobile smart phones and tablets enable business owners to plan and implement their business sale during a busy day, even when on the move. Online business tools are a very time-efficient way of processing information. 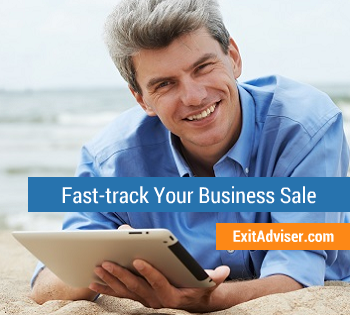 Founded in 2013, ExitAdviser is a simple-to-use, cloud-based service helping small business owners to prepare and execute their own business sale. By reducing the selling task to just 4 clear stages, the owner can easily orchestrate the sale themselves. By providing leading-edge online tools, knowledge resources, expert-articles and useful templates, ExitAdviser increases the chance of selling a business for the highest possible price. A wealth of intuitive, clear information and resources all in one place, to get the job done. There's a large market for buying and selling businesses that is expected to grow significantly due to demographic factors. The Small Business Administration (SBA) estimates a base of over 5 million small businesses in the US owned by people aged over 55. Many of these owners are now motivated to sell and realize their investment particularly as the economy improves and business sale values increase.